This is a full color book of photographs, I have previewed it in black and white and it looks good on those Kindles also. It will display best on the Kindle Fire or on the color Kindle apps available for your computers and your devices (iPad etc). This is Volume 2 in a series of three. You can find book one here. 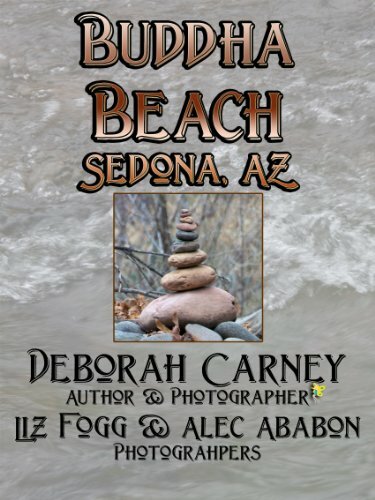 Buddha Beach (also known as Buddha’s Garden) is an area in the shadow of Cathedral Rock along Oak Creek in Sedona, Arizona. It is accessed via Crescent Moon Ranch which is managed by the Forest Service. As you exit the back of the park you will find a path that takes you along Oak Creek. As you walk down this peaceful path you will see people in the creek, people sitting in the shallow water or on the banks. Then you round a bend and see rock cairns, just a few to begin with. Then you see what appears to be a sentinel guarding the path. When you head farther down the trail, you start to see more rock cairns, which here are called Buddhas. As you look closer you will see the Buddhas are all unique, some are whimsical, some are complex. There are small ones and there are large ones. I invite you to enjoy this book filled with the rock Buddhas paired with quotes from Buddha. The first time I walked through the area it was what immediately came to my mind. Peace and serenity. Do you have photos of rock cairns? Show us! Tell Us Your Rock Cairn Story. Antelope Canyon is one of Arizona most prized slot canyons. Only a half mile long but filled with color, texture, and patterns to delight the visitor. It is not open to the public for exploring, you have to go with a Native American guide that will point out the “favorite” places to take photos but will also allow you time to capture the beauty on your own. This isn’t a photography “how-to” book, it is a “take a walk with me” and enjoy the beauty that exists in this photographic historical treasure. This was my first visit to a slot canyon and I was very excited to be going. If the weather had been bad, we would have missed our opportunity because during storms slot canyons can flood, and on a cloudy day the beautiful colors are not as vivid, if seen at all. The changing light accentuates the beauty of the canyon. As the light changes, as the sun moves, the canyon walls change and there are new visions. Although Antelope Canyon is only a half mile long, I took over 900 photographs because the walls were ever changing and the light from each step highlighted a new and different look. The photographs included in this book are the best of the best, but don’t be surprised if book two makes it’s way to publication as well. The only way to access Antelope Canyon is with a Native American guide. Due to vandals destroying parts of the Canyon it is now closed to the general public. Take a walk with me through this beautiful natural wonder and be fascinated by what the weather has done to create this testament to the power of Mother Nature. The photos are presented in the same order that they were taken, like you are walking along beside me.